This design is perfect for introducing your new little bundle of joy. Planning an Instagram announcement? Then you need this onesie!!! This style suits 2 names - first and last, first and middle - it's up to you! You can even just have one name if you prefer. This design is available in t-shirts and both short and long sleeve onesies in your choice of white, grey and black. The print is available in both our standard and luxe ranges giving you over 25 different colours for you to customise as you see fit. 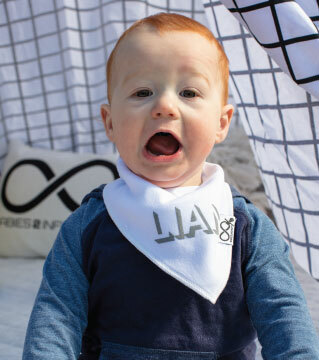 Our t-shirts and onesies are made from a beautiful, thick, 100% cotton fabric that is super soft and comfy – perfect for delicate baby skin. The T-shirts are available in sizes 000 – 4 and onesies in sizes 0000 – 1. Consult our sizing chart for further information. Press stud buttons are used in the shoulder of all onesies and for T-shirts sizes 000-0 to make dressing your little one a breeze (well a little easier). Our T-shirts for older kids (sizes 1-4) have a stretchy neck to make getting it on and off easy. Fabric may fade from sun exposure. This is not considered to be a flaw.